The cleft lip nasal deformity has been well described. However, for a long time, cleft surgeons feared that repair of the cleft lip nose at the time of primary repair would cause a growth disturbance especially of the nose. Hence the nasal deformity was not repaired until later. However, from the time of Blair and Barrett Brown, it has been shown that there are no deleterious growth effect from primary nasal interventions. At our centre the senior surgeon has performed primary nasal correction including septal respositioning from the late 1960s. There has been no deleterious growth effect and the overall appearance of the nose has actually improved. This is now well established through many objective studies. Hence it is now imperative that the deformity of the nose including the septum be addressed at the time of primary unilateral cleft lip repair. Nasoalveolar reconstruction for patients with cleft lip and palate is a challenging job for the surgeon. Many procedures to obtain esthetic results and decrease the cleft gap have been suggested. Presurgical nasoalveolar molding is used as an adjunct for reshaping the alveolar and nasal segments prior to surgical repair. Rehabilitation of cleft lip and palate usually requires a team approach which includes a plastic surgeon, orthodontist, speech therapist, pediatrician and a prosthodontist. In the recent times there have been many controversies regarding the same concept. This paper describes the changing concepts in the treatment of patients with cleft lip and palate, discusses the various views given by different individuals, focuses on the current concepts and also on the long-term benefits of the same. With time, the concept of treatment of cleft lip and palate has changed. Nowadays more emphasis is laid on the nasal and alveolar molding prior to the primary surgical lip repair. This molding reduces the number of revision surgeries to be performed later. Objective: The objective of this study was to evaluate the effects of presurgical nasoalveolar molding (PNAM) therapy by standard Grayson technique (G1) and Yen Modification single step NAM technique (G2) on alveolar tissues in patients with unilateral cleft lip and palate (UCLP) using three-dimensional digital models. Materials and Methods: Totally, 10 patients with a mean age of 20 ± 16.07 days, having complete UCLP, were included in this prospective study. The maxillary plaster models were scanned. The study sample was divided into two group of 5 UCLP patients (G1 treated by standard Grayson technique and G2 treated by Yen Modification) for linear, angular, and area measurements before and after PNAM therapy. The distances between the identified landmarks were measured on the maxillary casts, and the distance and area measurements were performed using software Poly works (IIT Delhi). All subjects had undergone PNAM therapy for 3 months, the alveolar segments should have been approximated (≤5 mm), and the cleft width after PNAM should be reduced. Results: The decrease of the cleft width and arch length on the cleft side were significantly altered on the affected side (P < 0.005). No significant changes were observed when comparing both the groups using standard Grayson technique and Yen Modification single step NAM technique (G1 and G2). Conclusion: PNAM therapy effects mainly in the anterior alveolar segment and reduction of palatal and alveolar cleft width in patients with unilateral clefts of lip, alveolus, and palate in both Grayson and Yen Modification single step NAM technique. 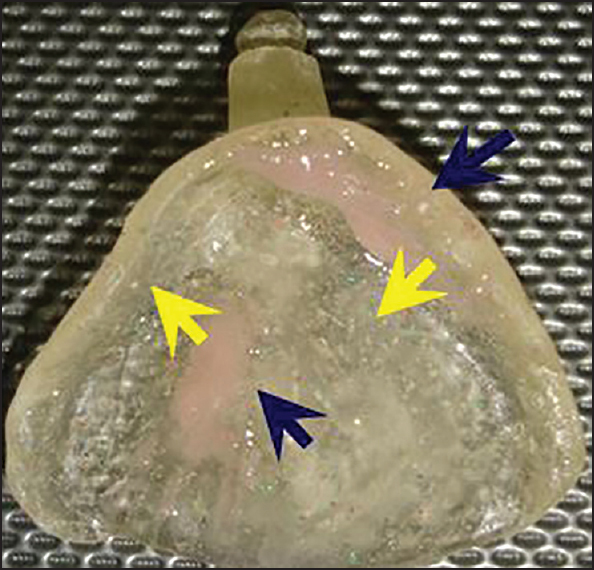 Both the Groups G1 and G2 suggested same treatment outcome in term of alveolar molding, but single step technique reduces patient's visits. Objective: The objective was to investigate the association between consanguinity and clefts in the craniofacial region. 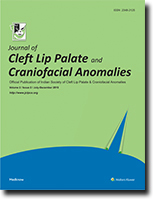 Materials and Methods: Sample consists of 179 non-syndromic cases of clefts in the craniofacial region and 200 healthy controls with no cleft or family history of clefting. A standardized questionnaire was prepared to investigate the information on the demographic characteristics and consanguinity. Chi-square and odds ratio were used to evaluate the risk of consanguinity in clefts in the craniofacial region. Results: There is a significant association between consanguinity and clefts (P = 0.001) when comparing the consanguinity and no consanguinity in cleft group and non-cleft group, and the association is more with the second degree consanguinity than the third degree consanguinity. Conclusion: Consanguinity is a risk factor for clefts in the craniofacial region. 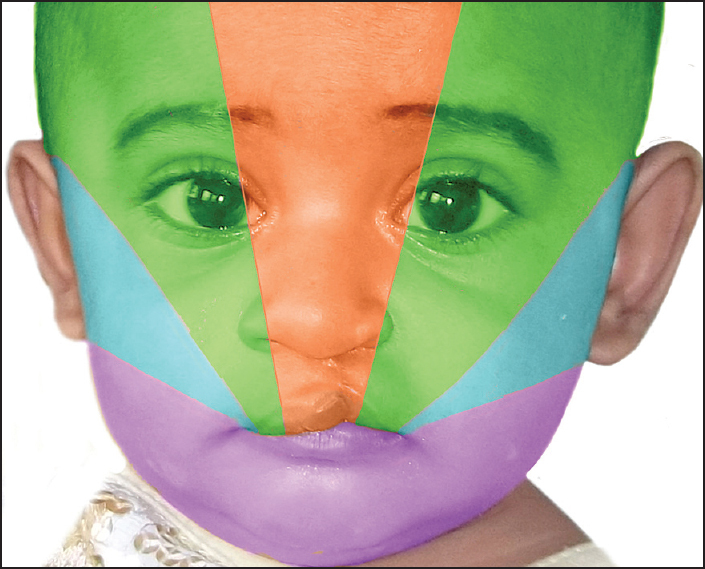 This clinical study aims at evaluating the effect of music therapy on pain relief and postoperative analgesic requirement in patients with unilateral cleft lip undergoing repair by Tennison's triangular variant, in the age group of 6-12 months. A total of 105 patients fulfilling the inclusion criteria were included in this study with 50 patients receiving music therapy and 55 patients not receiving the same. The hemodynamic parameters and objective pain scale by Hanallah were assessed by a person blinded to the groups. When tested, the results showed a statistically significant decrease in the mean number of times fentanyl was required and in the mean pain score. However, there was no significant difference between the 2 groups with respect to oxygen saturation and heart rate. Objectives: To correlate dental anomalies in different cleft groups with that of the neural crest developmental fields. Materials and Methods: The study was performed at the Department of Orthodontics, Tamil Nadu Government Dental College and Hospital, Chennai on 60 subjects with cleft of lip, palate in the age group of 12-25 years of both genders. Subjects were divided into two major groups. Group A consisted of 30 subjects with unilateral cleft lip and palate (UCLP) and Group B comprised of 30 subjects with bilateral cleft lip and palate (BCLP). For assessment purpose both right and left side UCLP patients were grouped together. 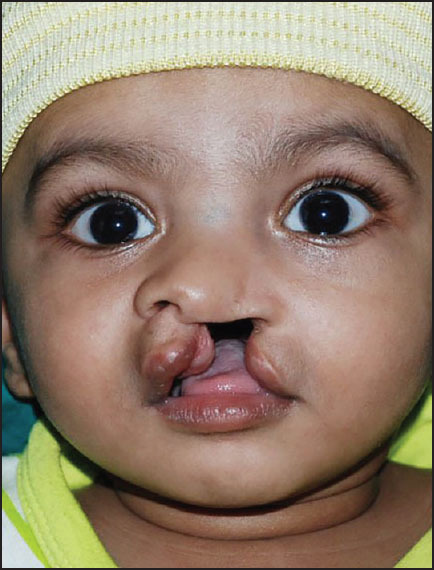 The subjects were classified by cleft type into one of three groups as unilateral left cleft lip and palate, unilateral right cleft lip and palate, BCLP. Results: Statistical analysis using Chi-square test yielded significant differences in agenesis of tooth (P < 0.001), ectopic eruption (P < 0.001), rotated tooth (P < 0.001), and impacted tooth (P < 0.001). The other dental anomalies did not yield any significant differences. Conclusion: Agenesis of the lateral incisor was the most common dental anomaly in the frontonasal field area. The ectopic eruption was the prevalent dental anomaly in the maxillary field area and agenesis of second premolar in the palatine field area. Background: We strive to achieve a functional and aesthetic repair in cleft lip patients bestowing them with all natural landmarks and making the evidence of the repair undetectable for better quality of life and complete social acceptance. The last to offer is a moustache for an adolescent male cleft lip patient. Aim: The current study is a review of moustache restoration carried out for patients after cleft lip repair. It includes 18 cases with a follow-up of 6 months to 2 years. Materials and Methods: Follicular unit extraction using 0.9 mm motorized punches is the preferred technique. Alternative method is follicular unit transplant strip technique, where individual hair follicles are dissected for a 0.5-0.6 cm × 5-6 cm strip of scalp. Each follicle serves as a micro graft. 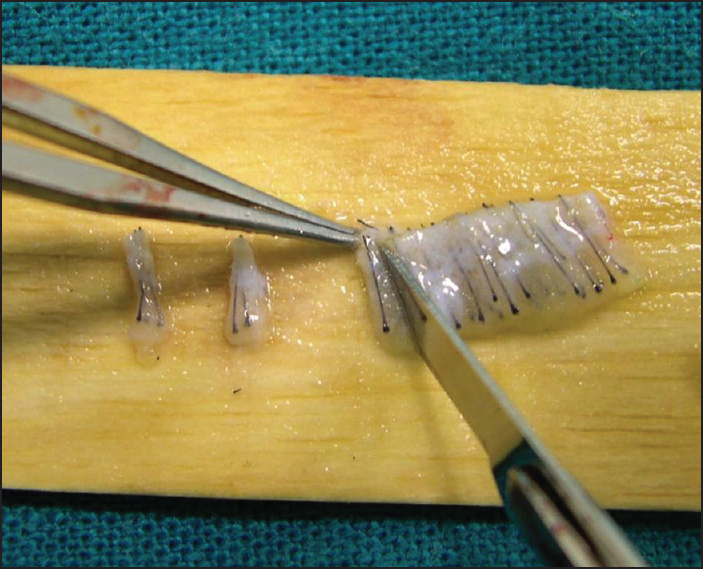 Grafts are implanted in premade needle tracks flush to the skin. Spacing is 2-3 mm in the first sitting. Second sitting may be planned 6-8 months later to add density. Results: Hair growth along the scar is delayed, it begins 4-5 months after the transplant, and complete growth is seen by 6 months. There can be 7-10% loss of grafts. Conclusion: Follicular unit micro grafting can be used for restoration of moustache after a complete cleft lip repair. Moustache provides animation of the face, restoration of aesthetic landmark, taking away the typical cleft lip look and building up confidence of the patient. Congenital lateral oral synechia is a very rare anomaly which may be present in association with cleft palate and other facial abnormalities. 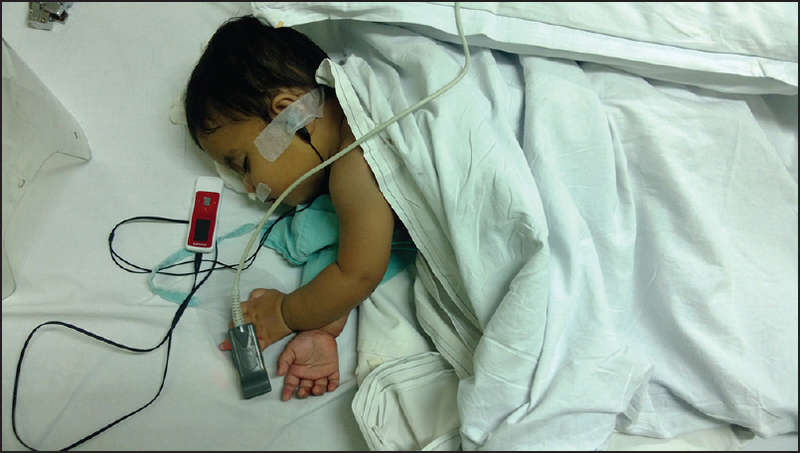 Infants with lateral oral synechiae usually present very early in the neonatal period with restricted mouth opening and the resultant feeding difficulty, warranting early operative intervention. In the present article the authors report a 12-year-old child with lateral oral synechiae and cleft palate, presenting in late childhood and managed successfully by single-stage surgical correction. A 30-year-old male presented with a hard palate fistula. He had a history of faciomaxillary injury 8 months back. He had nasal regurgitation after the injury. He had severe halitosis at the time of presentation. A large foam piece was removed through the fistula under general anesthesia. There was a lack of documentation regarding the placement of foam piece as a nasal pack during initial treatment. A need of good documentation of the removal of the foreign body is emphasized. Fraser syndrome is a rare autosomal recessive multisystem disorder characterized by features such as cryptophthalmos, syndactyly, congenital malformations, and abnormal genitalia. We report a case of 13-year-old male, who had multiple congenital anomalies and clinico radiological features consistent with Fraser syndrome without cryptophthalmos. The projecting premaxilla in case of bilateral cleft lip and palate presents a great challenge to the surgical repair of the cleft lip due to difficulty in suturing the large defect. 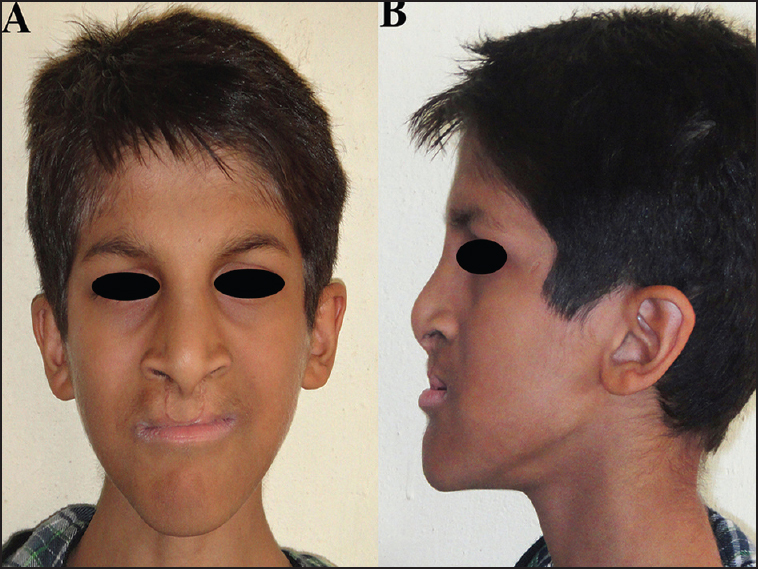 Furthermore, the short columella and nasal dysmorphology result in compromised esthetics even with repeated surgeries. 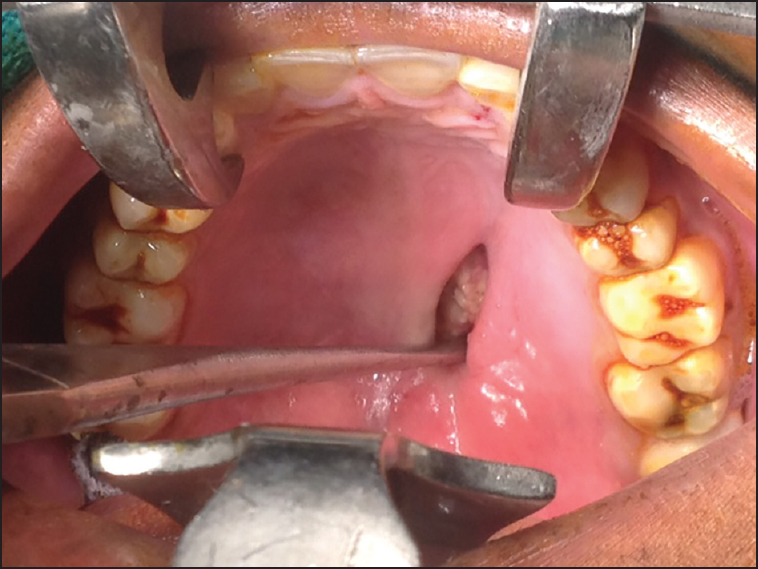 The current case report describes the use of an expansion screw for retraction of cleft premaxilla prior to surgical repair along with nasal molding in a 5-month-old infant.